As part of the Atlanta-based restaurant’s Cow Appreciation Day celebration, customers who show their spots eat free on Friday, July 11 at any one of the chain’s 1,800-plus restaurants. wearing a cow-spotted accessory, such as a hat, scarf, tie or purse. 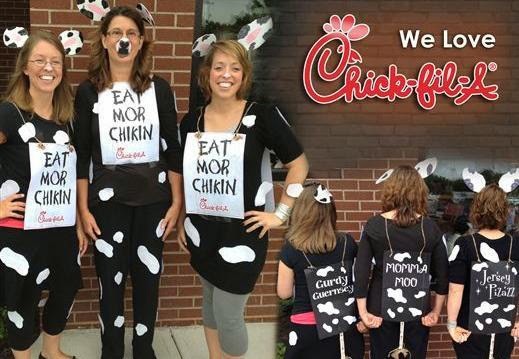 In 2013, more than 900,000 customers visited Chick Fil A restaurants dressed as cows for Cow Appreciation Day. “Every year we are amazed at the number of new customers who participate in Cow Appreciation Day, as well as the customers who make it an annual tradition with their families,” said Steve Robinson, chief marketing officer for Chick Fil A, Inc.
Chick Fil A has a website — CowAppreciationDay.com — dedicated to the event. The site offers in-depth details on the celebration, cow costume ideas, as well as downloadable cow spots, masks and other bovine themed accessories customers can use to create costumes.